Spent the first night in Argentina camped in front of a police station. 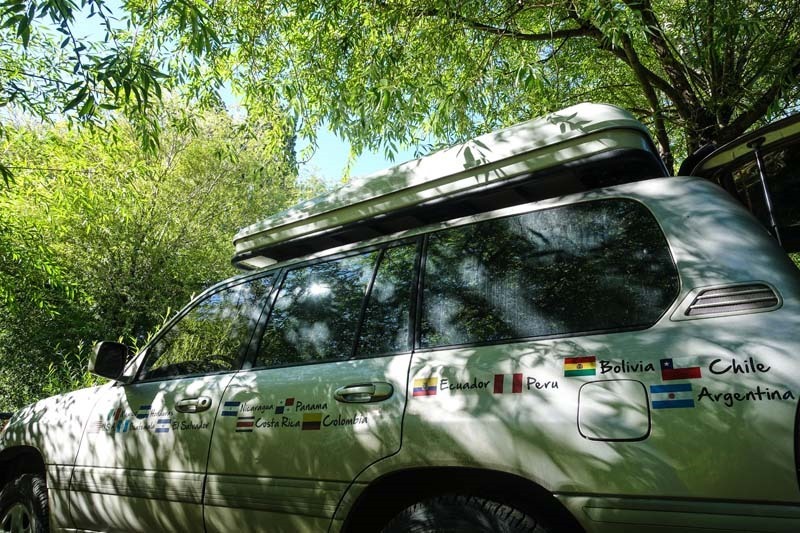 The wind in Patagonia was so strong that we had to find some cover, otherwise the tent would blow away. 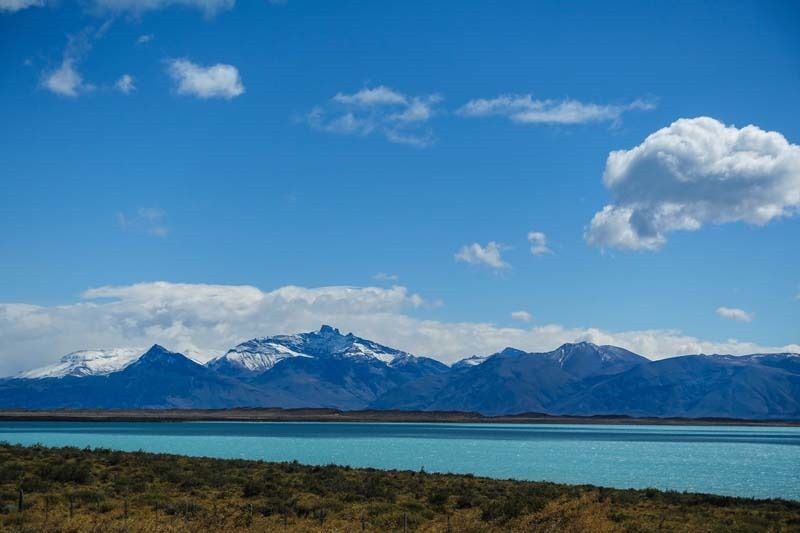 At this part of Patagonia the land is absolutely flat, without any trees and nothing to stop the ferocious winds coming from the West. Luckily, the police station had a large tree that blocked enough wind for our tent to hold through the night. In the morning, Hyein was up and about excited…why, whats going on babe? 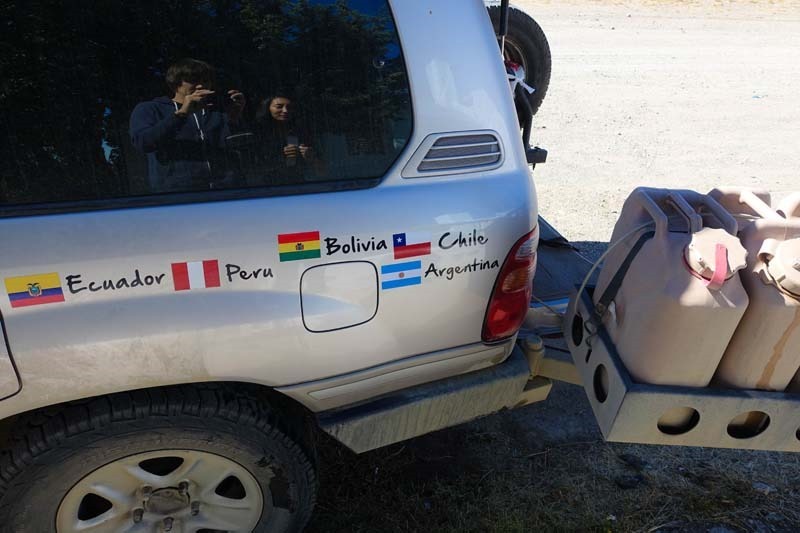 “We get to put on another sticker!” Oh yeah of course we are now in our 13th country? Washed just enough of the car to put on the flag and the name. After the crooked mistakes of Nicaragua, we take extra care to be as level as possible. 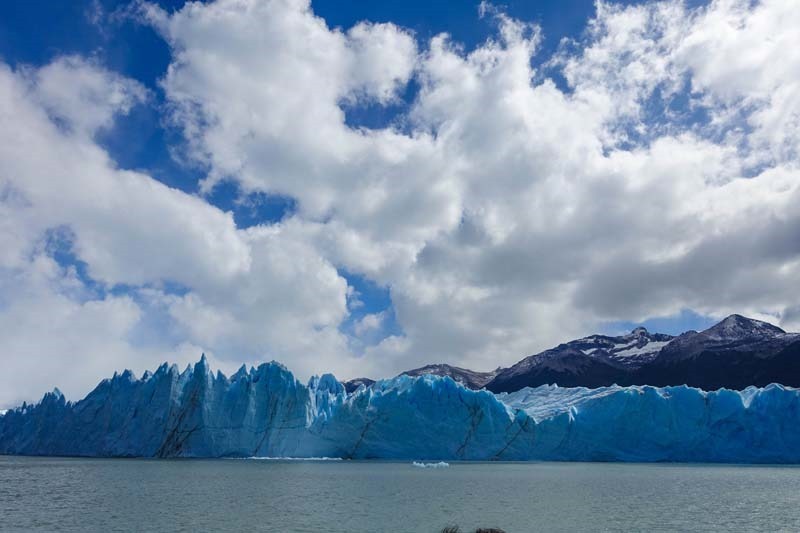 Our destination today was El Calafate, a small town near the famous Perito Moreno Glacier. 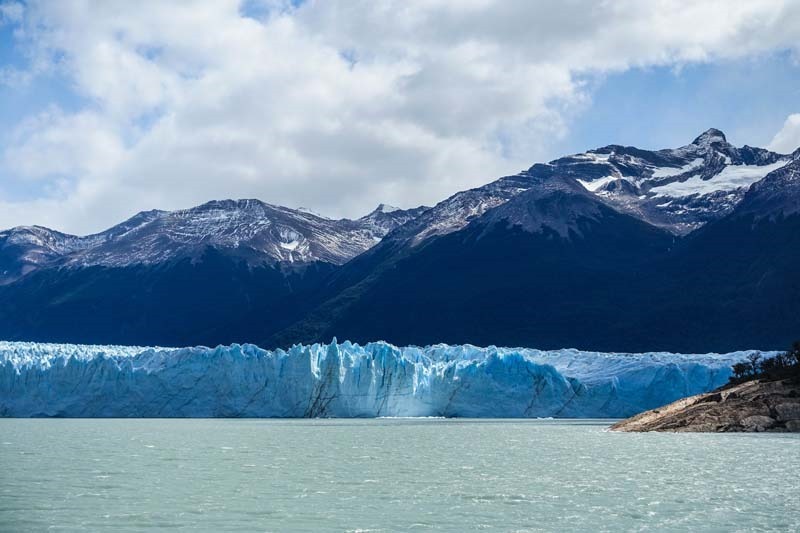 But before we get all googly-eyed about the glacier and how awesome it is, lets talk about Argentina’s real tourist attraction – beef and wine. 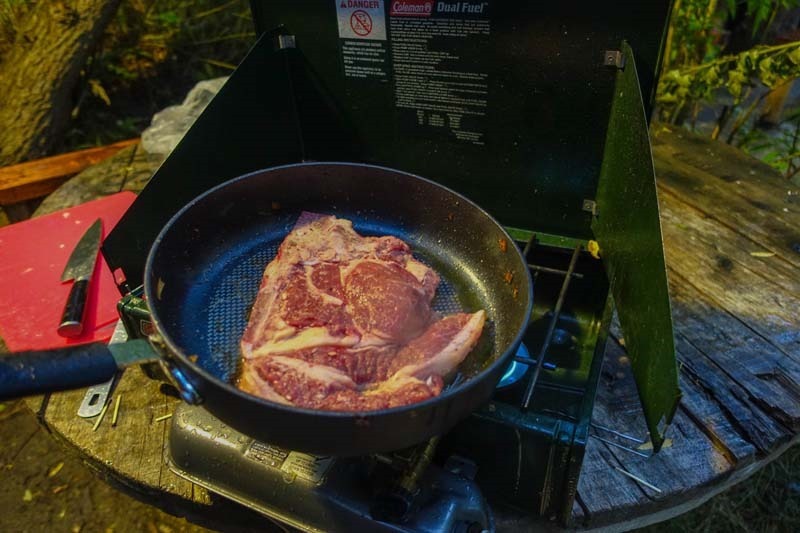 That’s right – “beef, its what’s for dinner”. 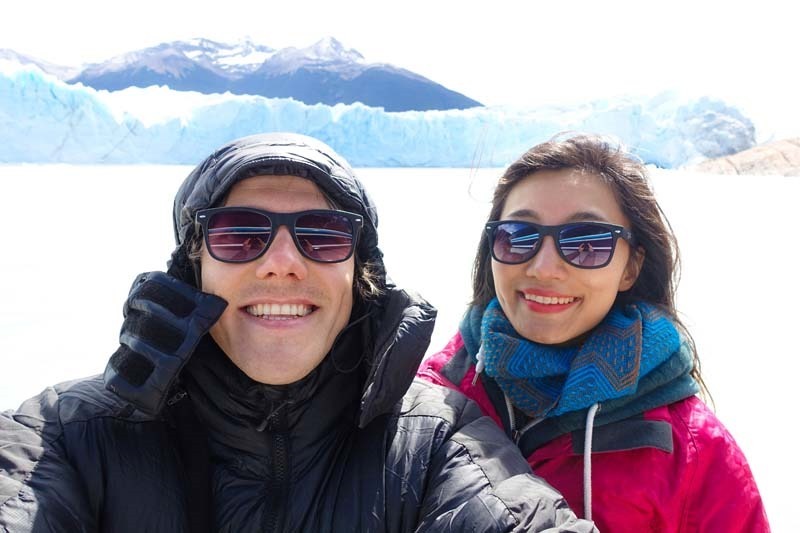 After going to every single ATM in El Calafate and finding all of them without money, more about that later…we spent our last money on wine and steaks. For whatever reason, we haven’t bought much fresh meat on the trip. Sure, we would get sausages, chorizo, hot dogs and cooked meat, just nothing raw. Not anymore. I’ve heard great things about the Argentine beef, lets see if it is up to snuff. 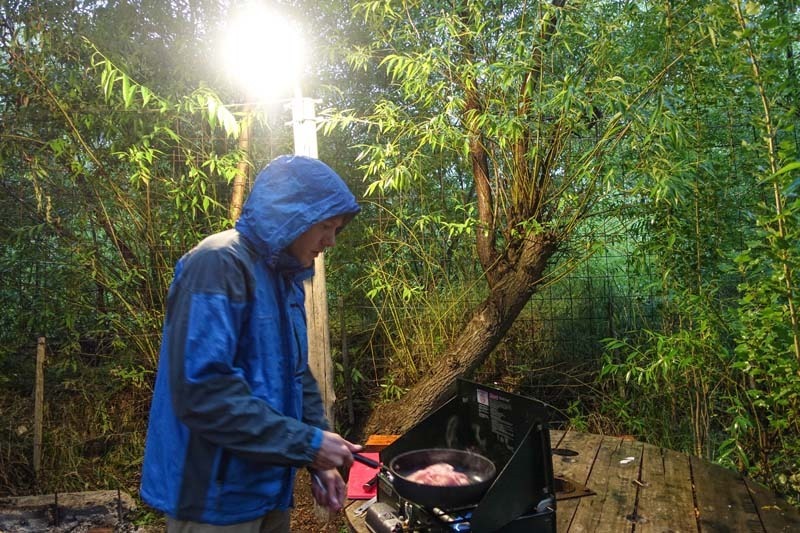 Hungry and determined to have the best meal in weeks, not even rain could stop me. 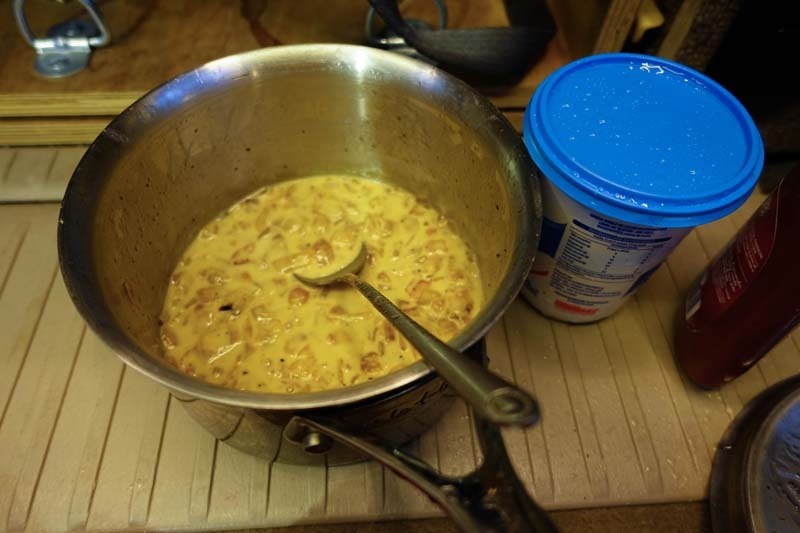 The menu for the day – steaks and onion and cream sauce with baguette. It was better than you are imagining it right now. The morning greeted us with sunshine and warmth, let’s go look at that ice-cube. The glacier itself is about an hour away from the town. If you made wrong choice in life and did not bring your own car for this trip, i guess you could be a peasant and take one of the hundred tour buses from town. But then you have to interact with other people, how quaint. The entrance fee will set you back 200 local shekels or about 14 real dollars. You can pretend to be a local, but somehow we always fail to pass that test…one day we will outsmart them. Maybe our Spanish is not at the native level…not that can’t be the reason…we are basically fluent. 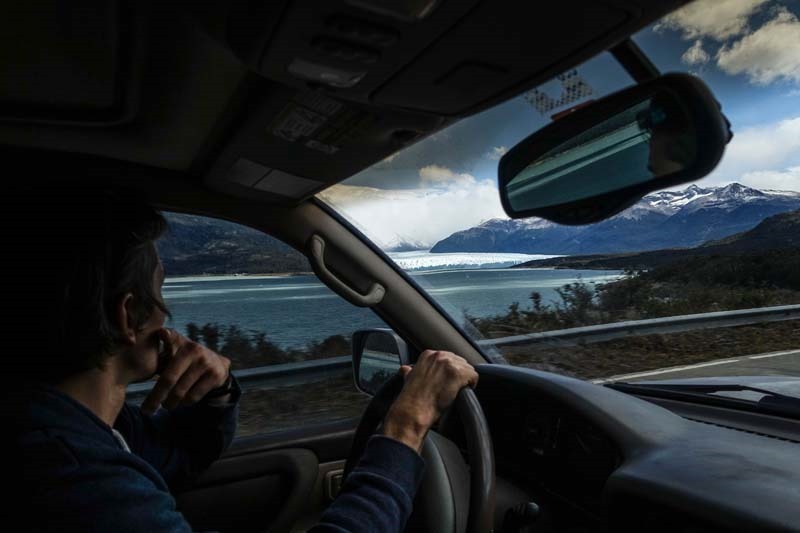 The photo is a bit dark, but we are not focusing on me here…its all about the glacier. You see it? It’s that white strip in the background. 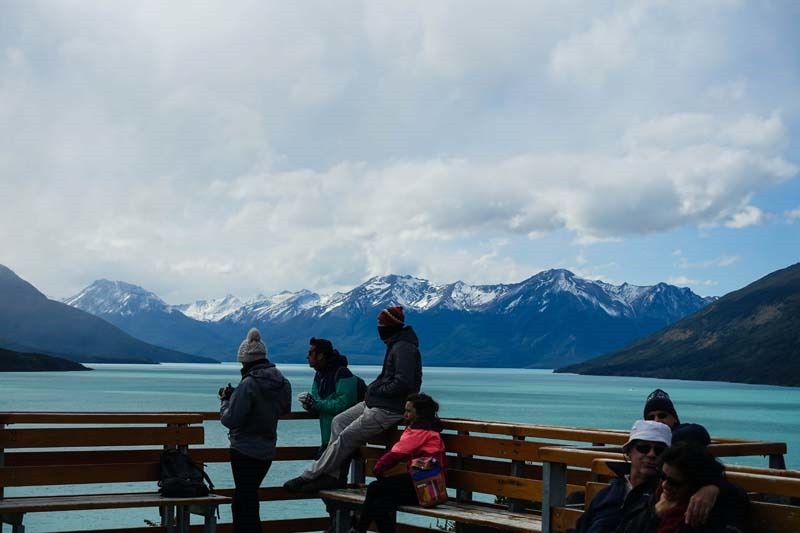 Before you get to the final parking lot, there is a little marina with hourly tours to the glacier. 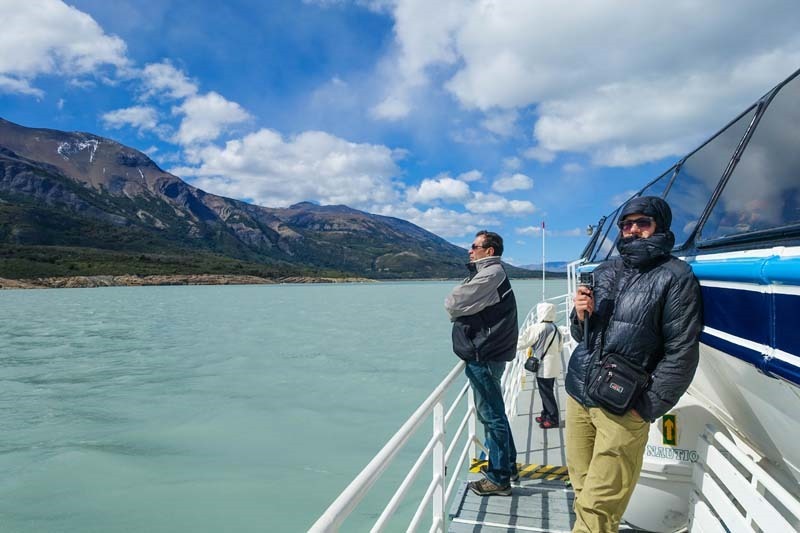 At this moment I realized that it was my life-long dream to take a boat up to the glacier. Hyein was genuinely surprised that I was willing to spend the money, but excited she went along. 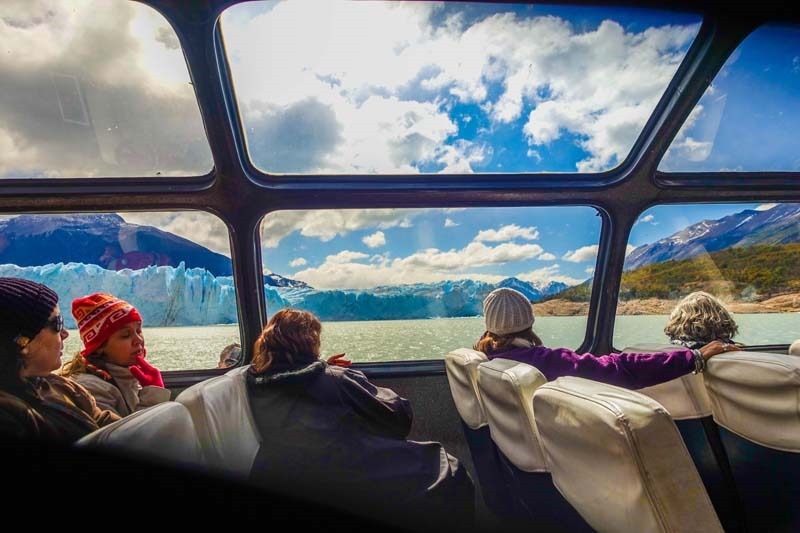 We try to keep to a strict budget of $100 a day…and here her husband is just going to spend a third of it on a little boat cruise…he has gone mad, mad with glacier fever. Finally get to wear all of our snow gear, Hyein, I think, has more than 5 layers on. 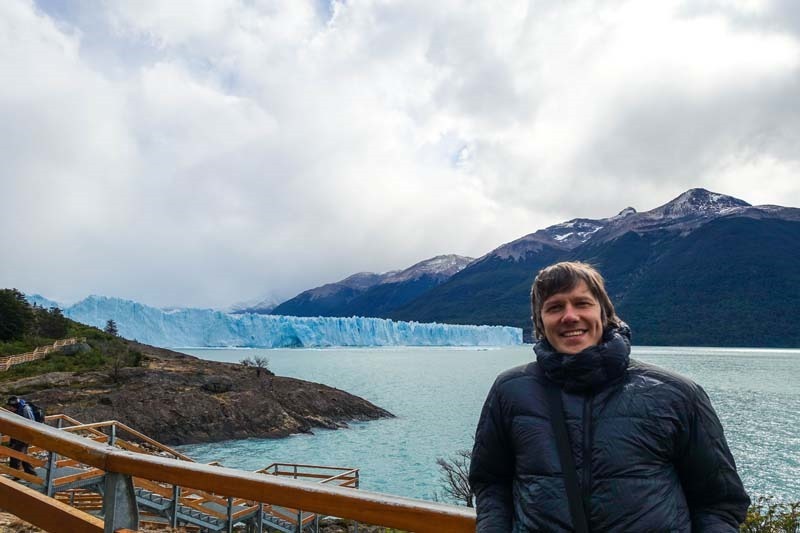 Pulling this from wiki and other sources on why it is so popular – but the gist of it is – Perito Moreno is one of only 3 GROWING glaciers in all of Patagonia. Plus, you can just walk up to it, so even the older travelers can see it without a problem. 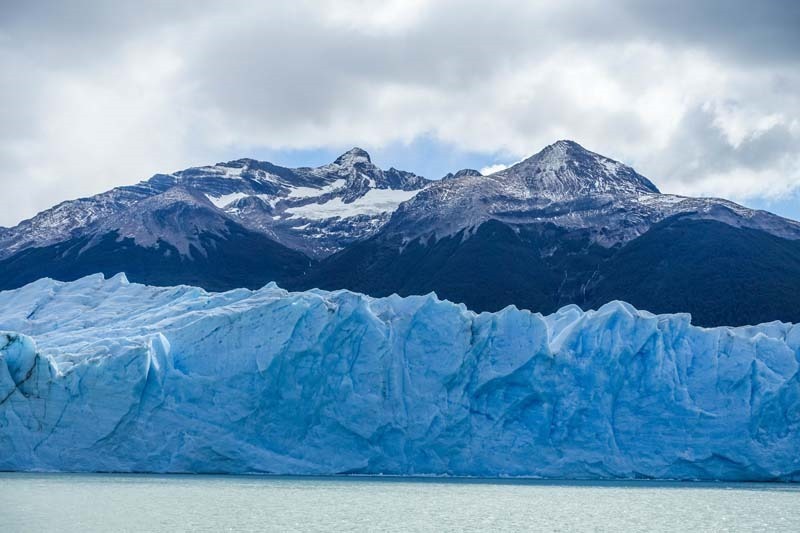 The glacier comes down from the mountains and in the center of the face it actually touches land, forming two independent lakes. The boat tour that we did was on the southern lake called “Brazo Rico”. 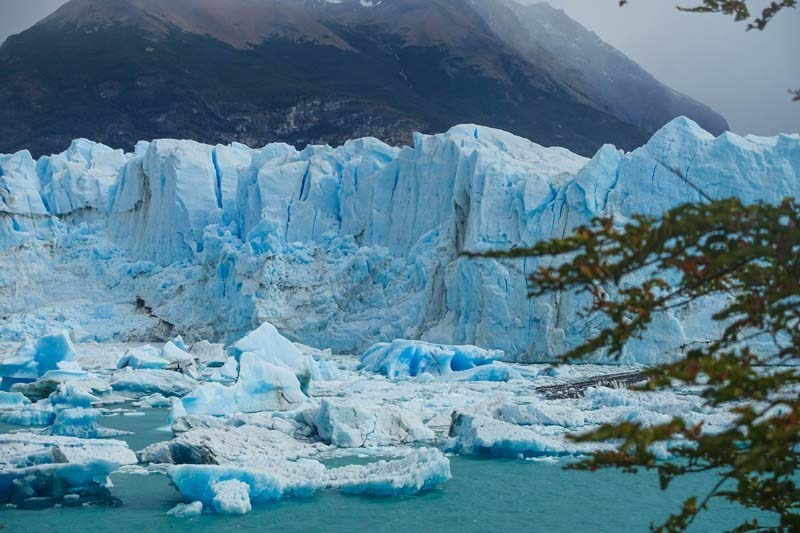 When the glacier touches land it can create a dam that stops the connection between the lakes. This can create a difference in the water levels between the lakes up to 5-6 meters. 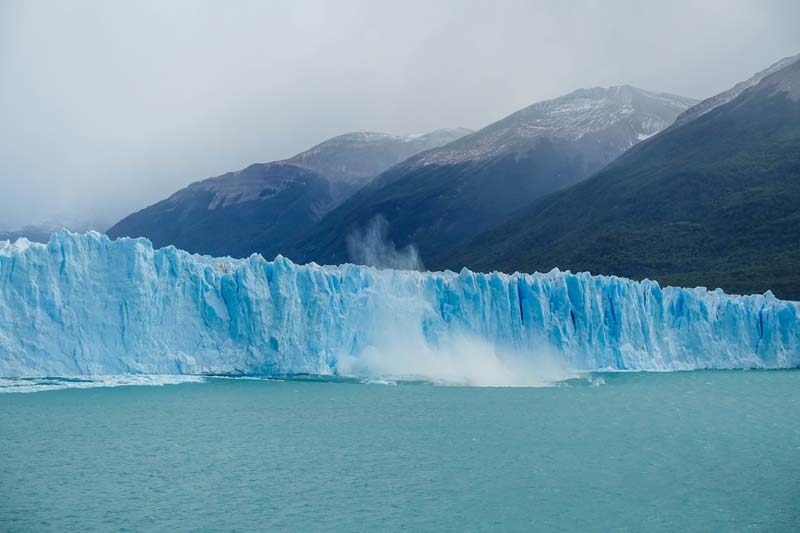 And when the water pressure is high enough it punches through the dam creating a dramatic rupture and ice fall. No…no…nope, the tour guide on the boat just announced that the color is an illusion. The ice itself is white and what we see is actually the reflection of the sky, sort of like the sea and ocean colors. Damn it, can’t even trust my own eyes here. 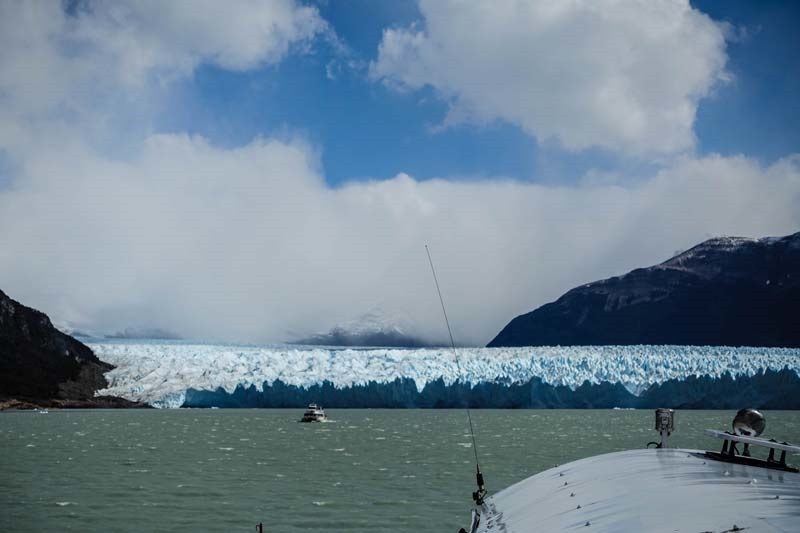 So all these photos so far are taken from the boat of the southern face of the glacier. 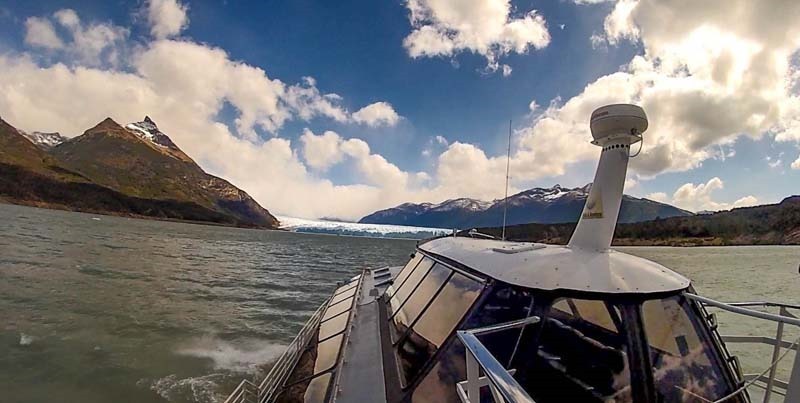 The boat couldn’t come all the way to the glacier because of unpredictable falling ice. But if you can use your imagination i’ll tell you some numbers for reference. 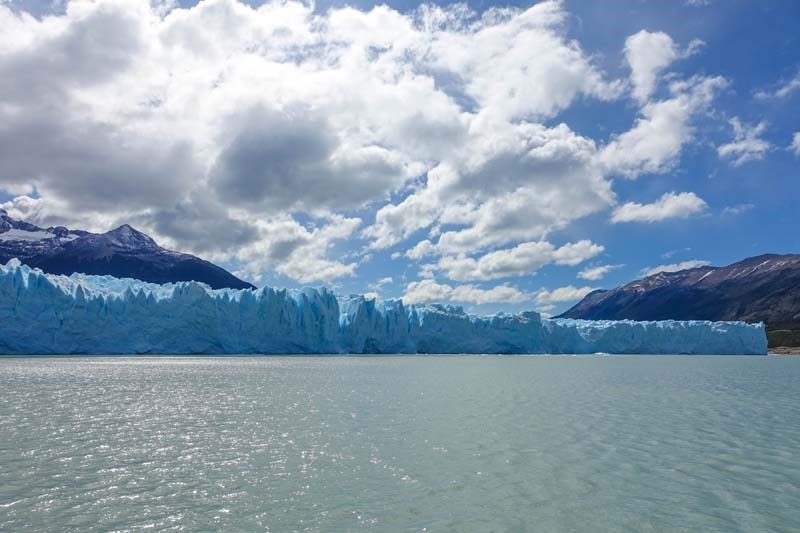 The height of the glacier is 70 meters above water or about 20 story high building. Jesus…i just did that calculation, according to wiki one story is 3.5 meter. But that is one large ice-cube. And as usual most of it is hidden under water. 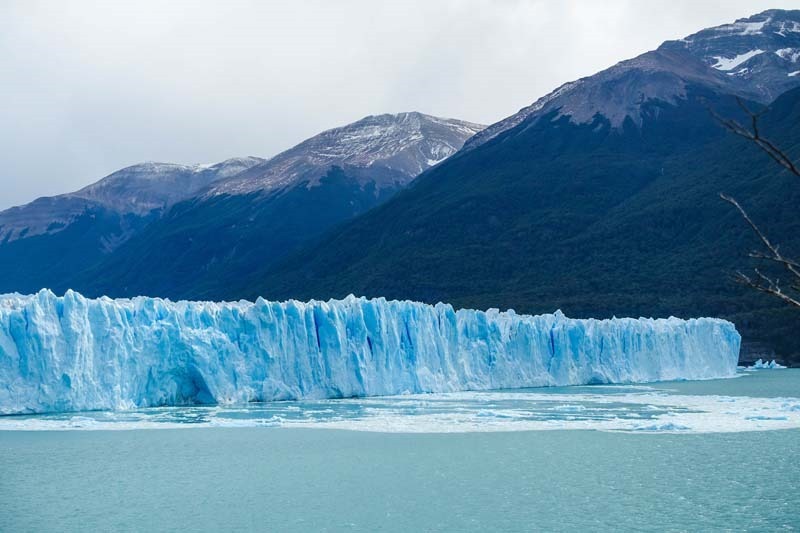 There is another 100 meters of ice under the water level….or another 30 stories. 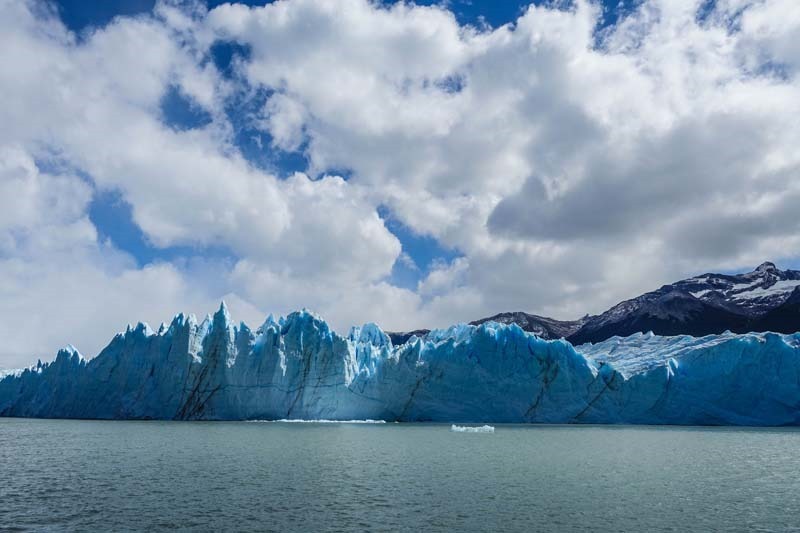 With all these numbers it is not hard to believe that this ice field (the mother of this glacier so to say) is the 3rd largest fresh water reserve in the world. Whaaaaaat?! Btw, can you guess the largest water reserve? I’ll give you a hint – its a lake, its in Russia and we are going to visit it. Give up? Okay, its Lake Baikal. How did i know that? Well Russians are very proud of their country and having largest and firsts of everything. So when you are a child in Russian school you learn about the deepest and best of all lakes – Lake Baikal. I think we are also Number 1 exporters of Potassium! 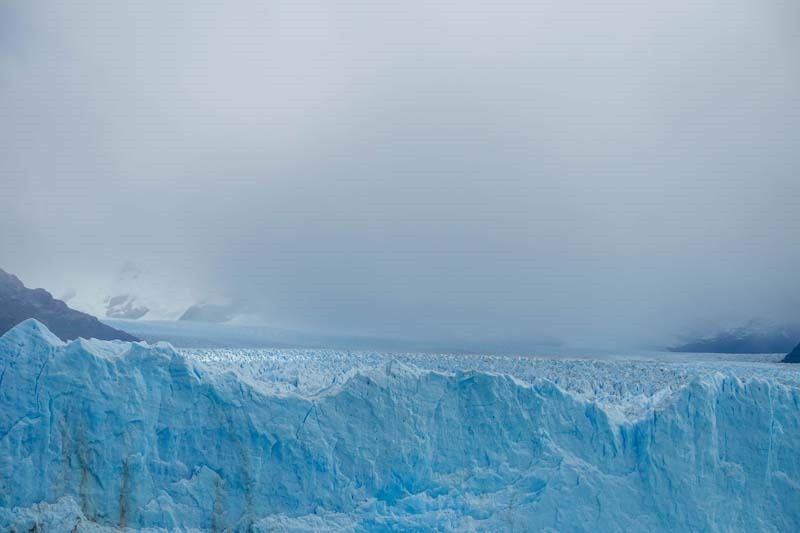 It is almost impossible to look at the glacier without sunglasses, it is so blindingly blue. Still on the southern part, looking towards the dam. 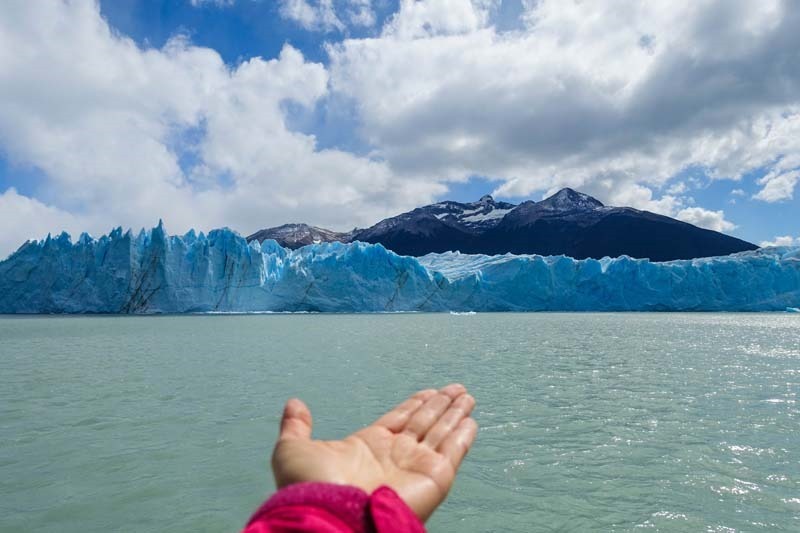 Argentina should buy this picture from Hyein to use in promotion of the glacier. Even though it was windy and cold, i stood outside the whole time with the GoPro rolling in hopes of capturing a calving event, thats when the ice breaks and falls in the water. It is almost impossible to predict when the next piece will fall and where. On this side of the glacier we saw a few “little” calvings, the quotes are there only because of difficulty in size perception. 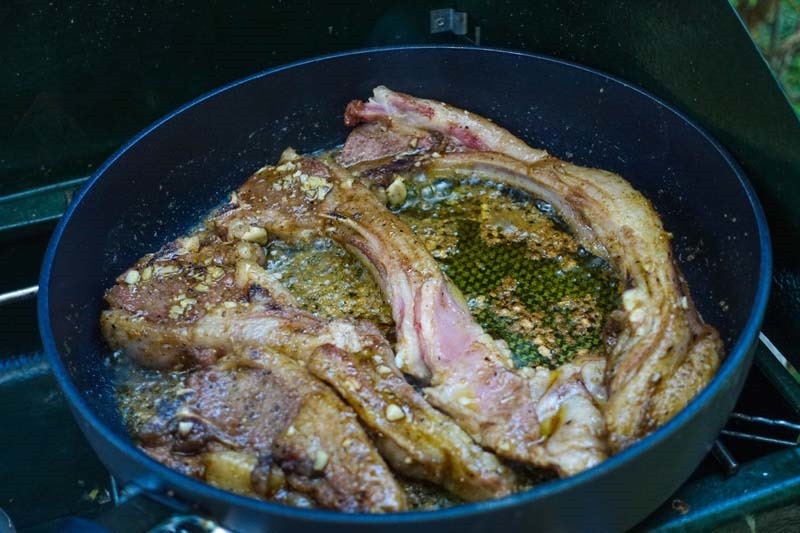 The chunks we saw falling were easily larger than our Hodori. 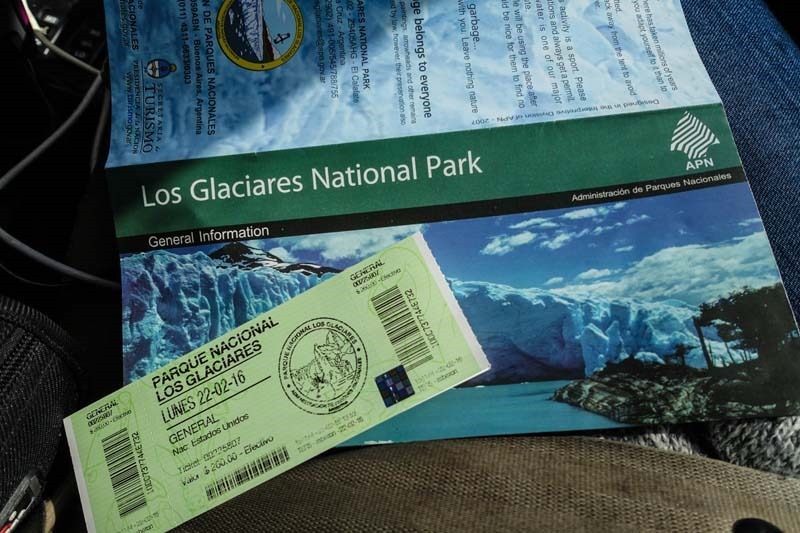 After the boat tour we drove and parked at the trail-head for the Northern part of the glacier. A pleasant 10 minute walk and we were right next to the face. 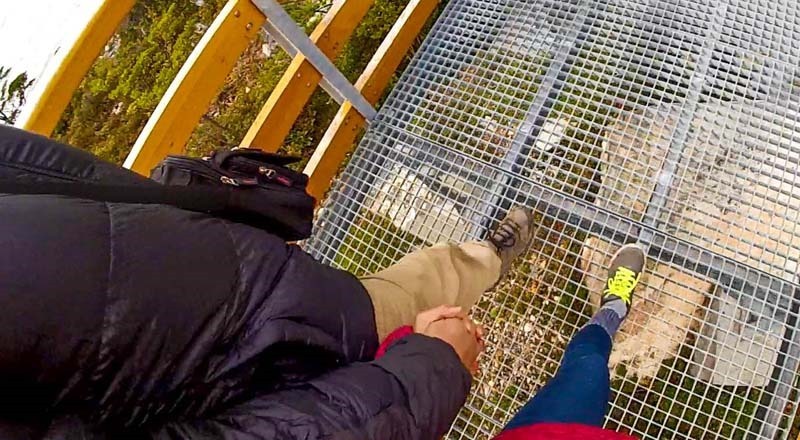 From the north you can walk up almost to the glacier and most importantly see the dam, look up – that’s the dam. 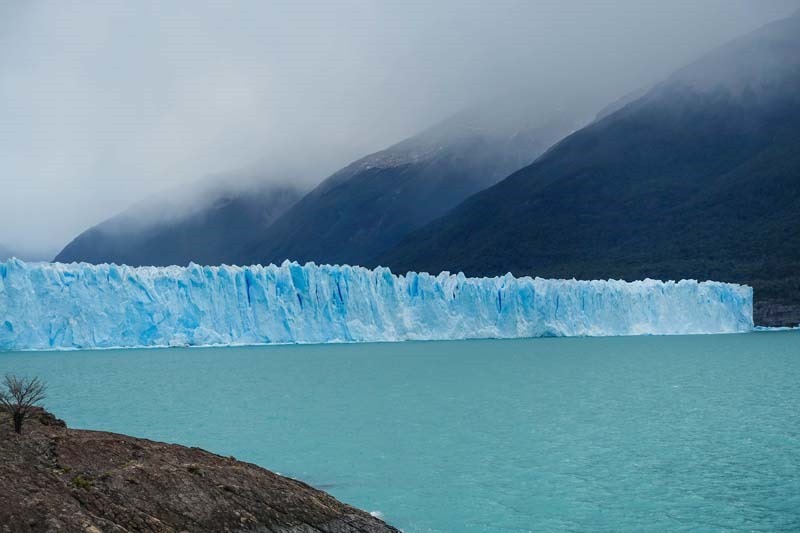 When we visited the glacier, the dam has held the water back since 2012. And literally a week ago on March 10th, it broke through with a huge rupture. Now everything that you see in the above photo is gone….can you imagine that? We did managed to capture the biggest calving that we saw. Hyein spotted a little crack forming and got her camera ready as soon as she could. Only to capture the ice hitting the water, still very cool. Ice slush floating away from the face. 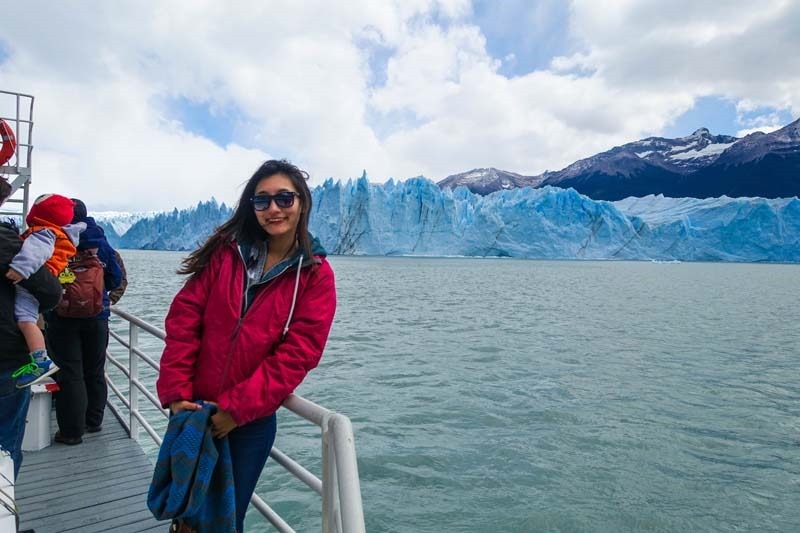 The park has really nice lounging areas, where you can chill and watch the glacier. 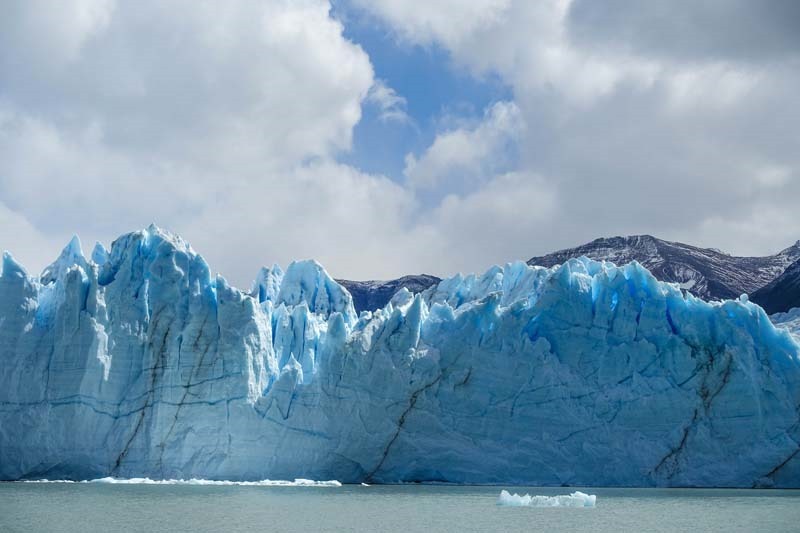 Everyone sits about, scanning the glacier’s face back and forth, hoping to catch the next big fall. The top view, you can see the glacier going back into the mountains for miles. And you can also see some crevasses. I love this picture of me…is it my hair? Stopped at the same supermarket as the day before to pick up some steaks. After i got the steaks, i walked around the meat section like a hungry lion, picking out his next victim. Beef wasn’t enough for today, i wanted something else. Saw a whole lamb hanging there and asked the butcher if he could cut me some ribs. No problem…as much as you want. It is usually a bad idea to do grocery shopping while hungry and Hyein is my voice of reason at these moments. Today, she knew that i needed something else and just let me make my own decisions. Or maybe she just liked the steaks i made the day before and knew that i couldn’t go wrong here? 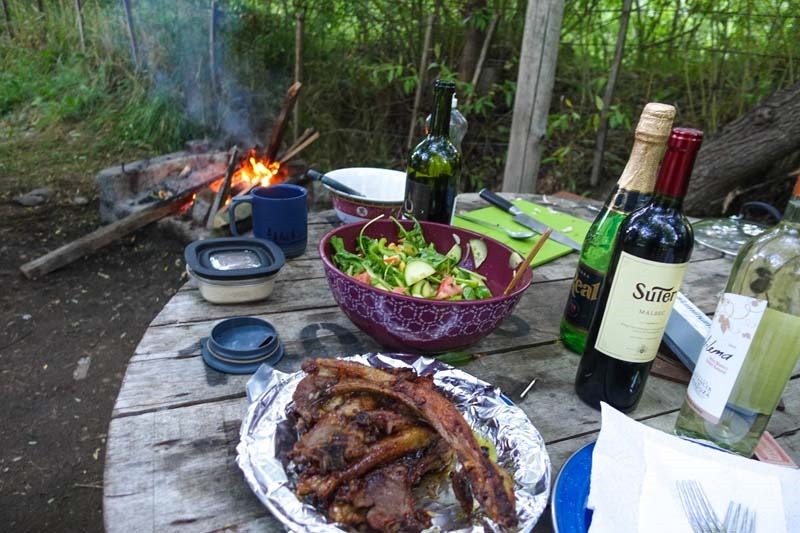 Campfire, wine, salad and lamb. 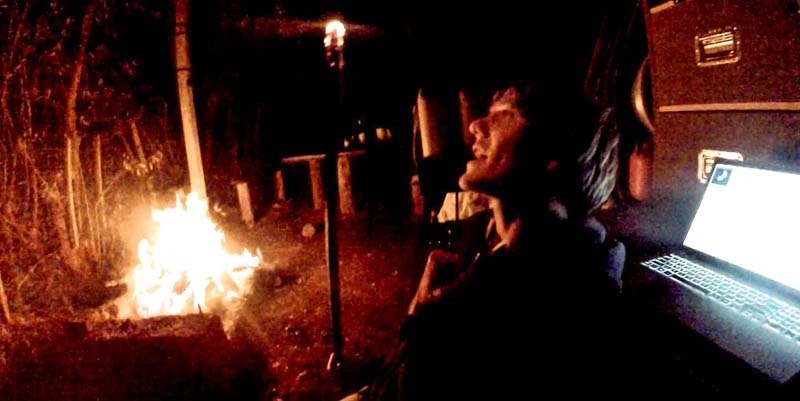 After a bit too much wine, i tried to sing. And if you know me and my singing…well, Sam Smith’s “Writings on the wall” would not be the best choice for me. 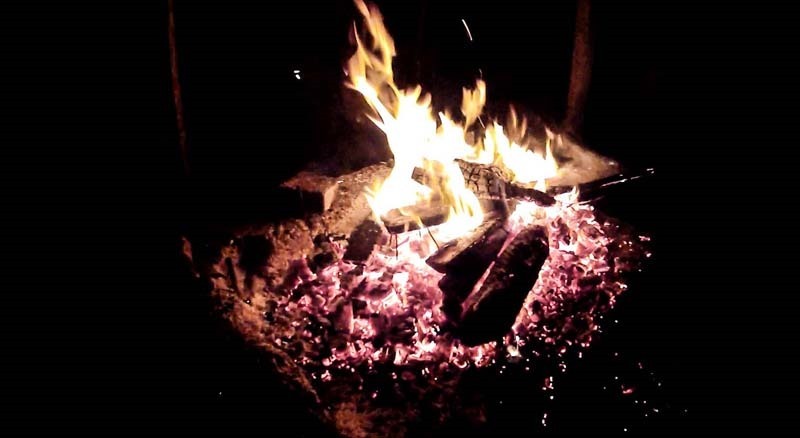 My only regret is that we started the fire too late and couldnt cook the lamb on these amazing coals. 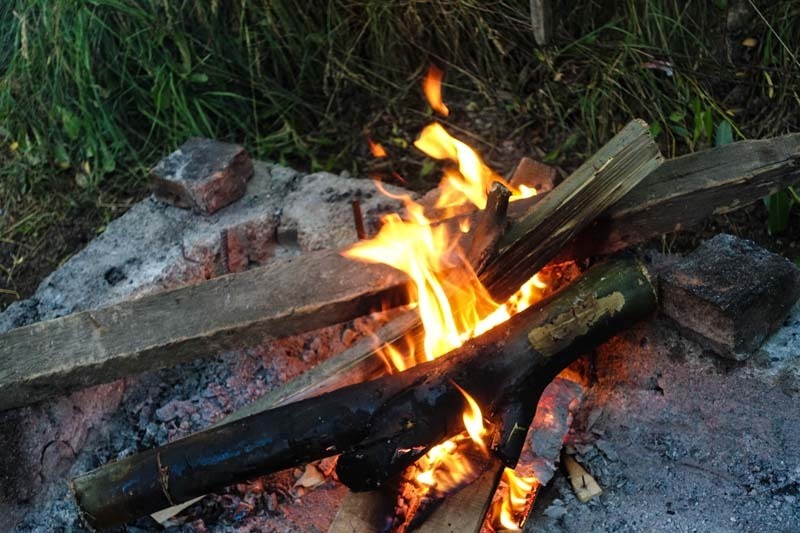 These were perfect for grilling a whole lamb, with all the fats slowly dripping down on to the fire, instantly burning and smoking the lamb. Ooooshhh, my mouth is watering as i write this. Oh yeah, back to the bank situation – Argentina’s banking system is out of whack, there are ALWAYS lines for the ATMs. And they constantly run out of cash, that’s during the week. On the weekends, forget about it and hope that your visa works or you have enough cash stashed away. Also, we had the most trouble trying to get money out, because our card would constantly get declined for whatever reason. So, a word of advise for anyone who will visit Argentina. If you see and ATM that you know works, get some money out. Better yet, take your daily limit. And enjoy the great food and wine.